The best things come in Small Packages”, this statement sounds true with the latest technology in Defence – NanoEye. 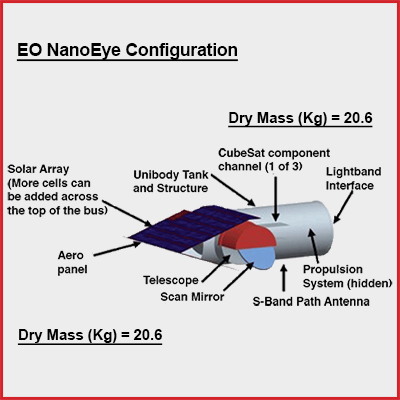 NanoEye is basically a prototype for a tiny class of spy satellite. The 20 kilogram NanoEye is meant to be cheap, maneuverable and able to take high-resolution pictures for small ground units in combat — kind of like the micro UAVs that are used by infantry units to provide near instant overhead ISR for troops in the field. In theory, ground troops will control NanoEyes and receive images from the satellites on laptops or radios within ten minutes of asking one of the tiny satellites to take a picture. NanoEye is conceived to provide rapid access to imagery over a specific location and launch within hours of call-up. 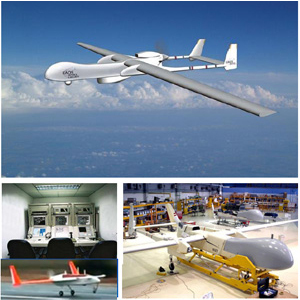 NanoEye can be flown in a very low orbit for duration of six months to a year. The optimal altitude for NanoEye is 200 kilometers to 300 kilometers, where it could produce imagery with ground resolution of 0.5 meters to 0.7 meters. Microcosm is one such company which is designing the satellite to be capable of flying as low as 160 kilometers, an altitude near the threshold for maintaining orbit. NanoEye could be very useful in environments where weather or the need to remain completely hidden from the enemy prevent ground troops from launching a small drone. Imagine clouds of these things waiting above warzones, ready to take satellite pictures on demand. Microcosm has developed a new 100-kilogram-class, liquid fueled rocket that could launch within 24 hours of call-up. NanoEye has a dry (no propellant) mass of about 20kg. With a wet mass (propellant included) of several times its dry mass, NanoEye has significant delta V available, al-lowing the spacecraft to change altitude to provide ground image resolution as needed. Aerodynamic shaping of the solar array structure in the spacecraft velocity direction lowers the drag factor, providing a longer life on orbit. These combined factors allow for low -cost tactical imaging sup-port to the field tactical units and Warfighters. Small satellites are accounting for a greater proportion of the total number of satellites launched each year, but there is no affordable option for launching the smallest of these satellites. The Space Experiments Review Board, which is the military’s mechanism for selecting small demonstration satellites for launch, has 59 approved missions. The Scorpius is another company to develop Mini-Sprite satellites which would be capable of launching 36 of these satellites. There is an underserved small satellite market, and it’s very difficult to get a single small satellite to orbit,” Scorpius believes it shall satisfy the market of satellites.